Aquarium Center | Just Shooting Memories! I have always loved the Tennessee Aquarium. Situated in Downtown Chattanooga on the Tennessee River, this has been a great attraction for the city. It is amazing how much just having this has revived this area of Chattanooga. 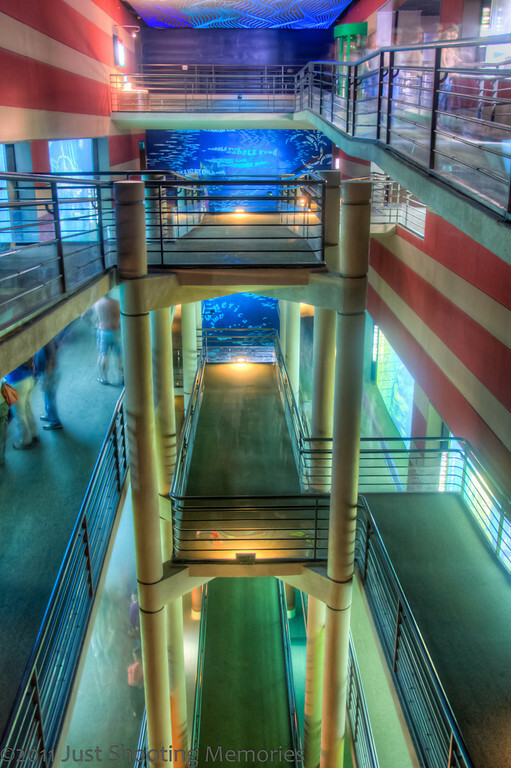 When you enter the aquarium, you travel a very long escalator to the top of the building and then begin working you way down. The exhibit halls are around the outside of the building and there is a ramp around the inside of the building that goes by the large exhibits in the middle of the building. This was a very difficult shot because the lighting is very low. I did not have a tripod for this, just the handrail. Great shot for being handheld. I sometimes carry a small table-top tripod to use against walls or even my chest for slower shutter-speeds. Couple that with an IS lens and you can get pretty slow.